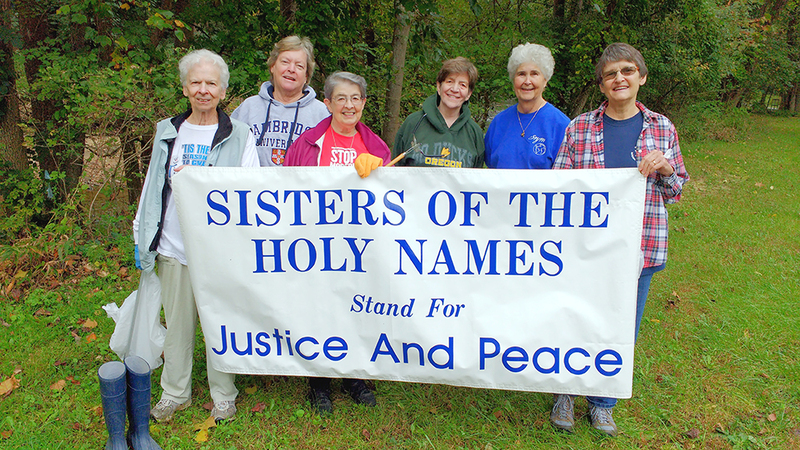 The Sisters of the Holy Names of the U.S.-Ontario Province stand with the caravan of immigrants and asylum seekers from Central America coming to our U.S. border. We are appalled by President Trump’s inflammatory remarks concerning these families forced from their homes by extraordinary violence from gangs, insecurity and corruption in their countries. 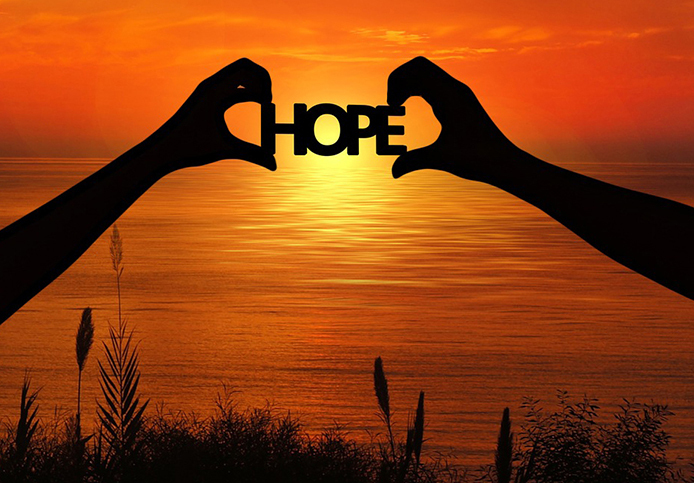 Families cannot live in this total fear without the hope of safety or sufficient income or a peaceful life. We ask the U.S. Congress to challenge the president to uphold the values our country has practiced for generations of welcoming immigrants and sheltering asylum seekers. It is a human right to seek asylum. The president’s comments about these immigrants are disrespectful and often not true, i.e., saying these refugees include terrorists from the Middle East and that they are invading our country. Now the administration is sending 5,200 troops to our southern border to stop this caravan of immigrants and asylum seekers. One retired military officer has declared that the military is deployed for war, not for assisting in apprehending immigrants. Why is the U.S. Congress letting the president basically declare war on families seeking to enter the U.S. to save their lives and to live in peace? Allow immigrants approaching our border to ask for protection in the U.S. and to be processed in a timely manner. Ensure that asylum seekers have access to legal counsel and receive a fair resolution to their claim. Guarantee that parents and children stay together while they seek asylum. We must remember that the great majority of U.S. citizens’ ancestors have been immigrants. 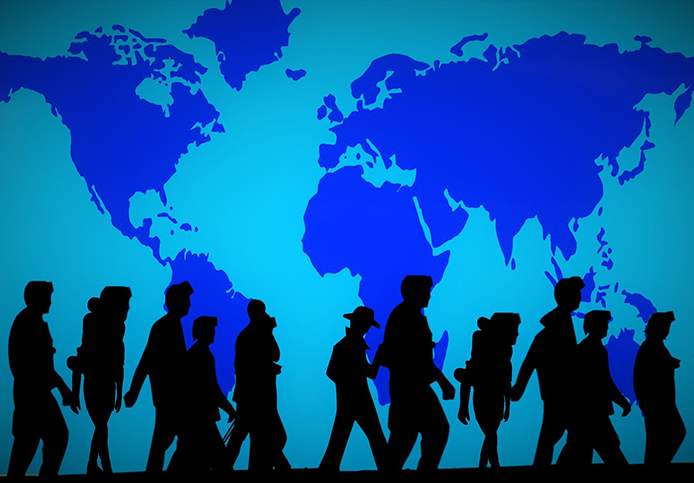 We want these current immigrants to have the same opportunity that our ancestors had. 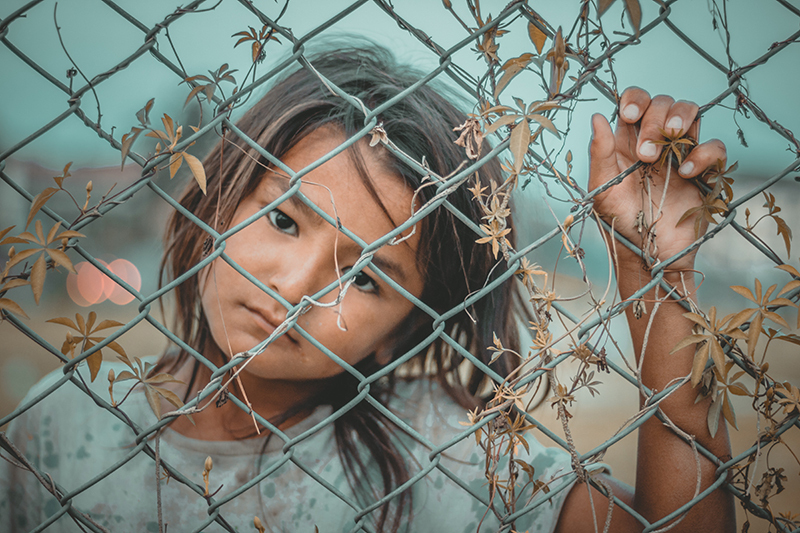 For those of us who are Christians, we are reminded that Jesus clearly said we are to “welcome the stranger.” In today’s world, the strangers among us certainly include immigrants and refugees. We urge all people of good will to contact your U.S. Congressional leaders to use their influence to stop our president’s current fear mongering and instead to allow immigrants and asylum seekers to cross the border and be humanely treated according to the laws of our country. 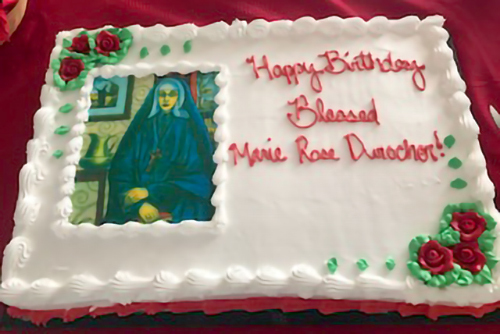 In the spirit of Blessed Marie Rose Durocher, people joined together on her feast day to witness to the mission she set in motion 175 years ago with the founding of the Sisters of the Holy Names of Jesus and Mary. Groups of Sisters, Associates, ministry partners, alumni, students, collaborators and friends planned activities on and around the SNJM Day of Service and Justice designated by the Congregational Leadership Team on Oct. 6, ranging from quiet prayers to advocacy for the needs of society and the Earth. 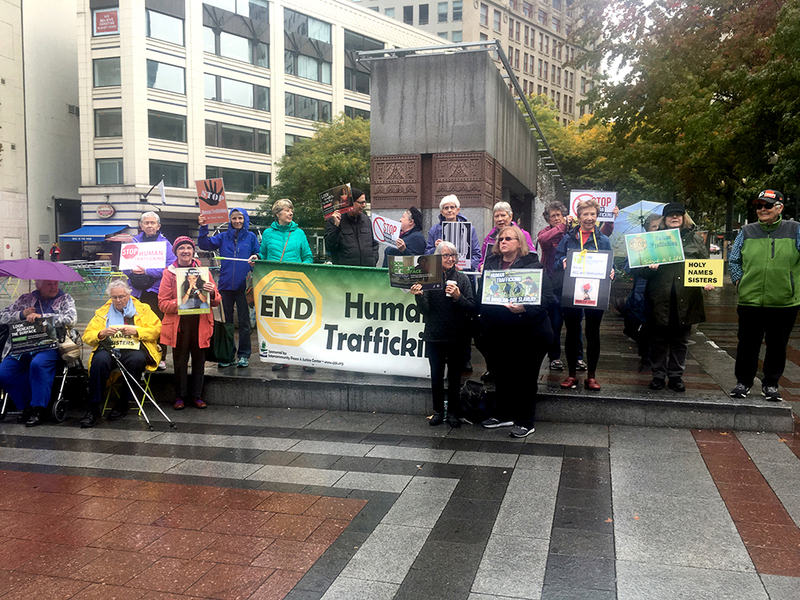 In Seattle, WA, 13 Sisters and Associates gathered with members of other religious congregations, Holy Names Academy students and others to participate in an anti-human trafficking vigil held in downtown Seattle, organized each month by the Intercommunity Peace and Justice Center. 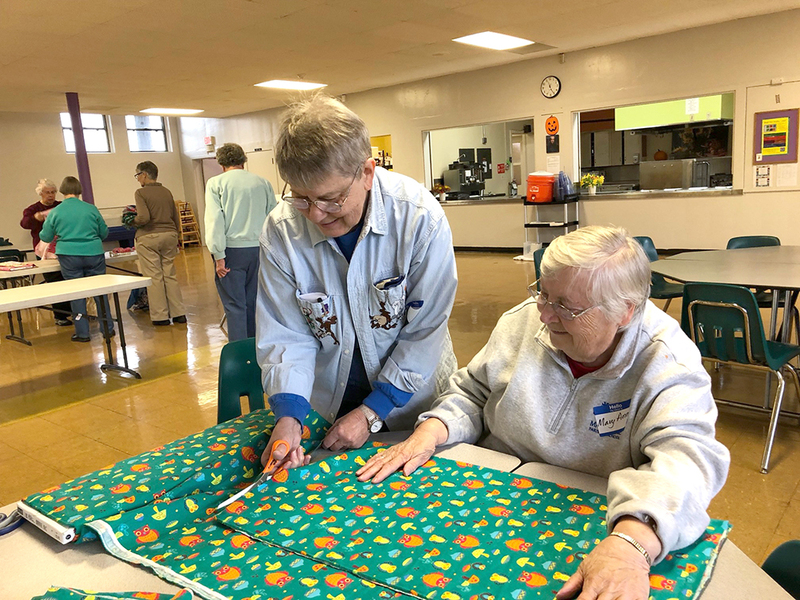 Members of Holy Redeemer Parish and students at St. Mary’s Academy in Portland, OR joined 19 Sisters who volunteered to cut fabric pieces for infant clothes, blankets and bibs. 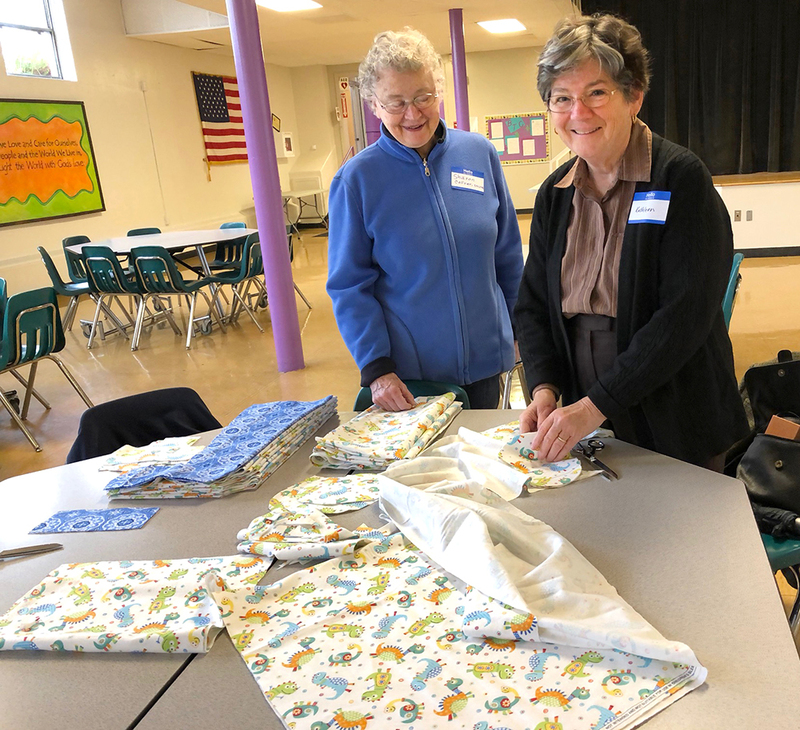 Mary Murphy, a St. Mary’s alumna and Holy Redeemer parishioner, sews the pieces for Mother & Child, formerly Birthright, a nonprofit that assists women and children in need. 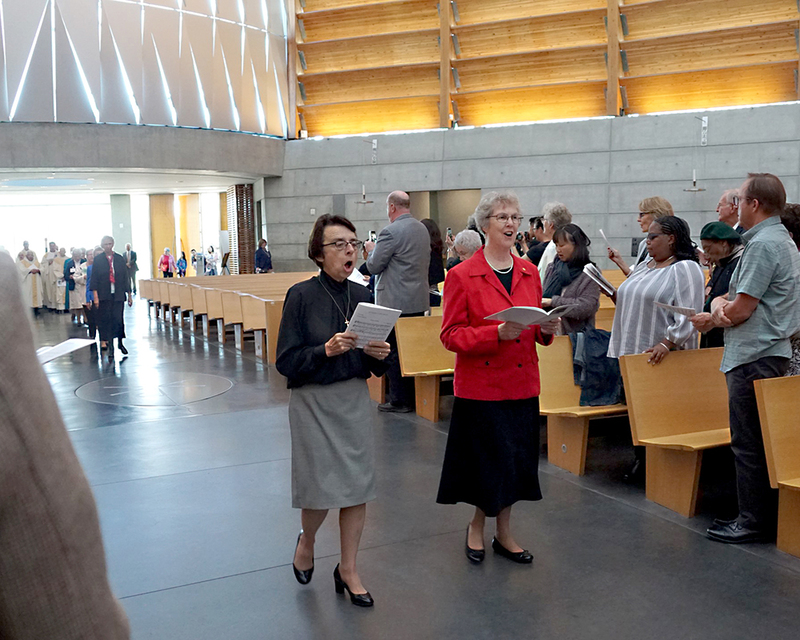 Meanwhile, Sisters Joan Flynn and Cathy Beckley joined a rally calling for an end to the contract between a regional Oregon prison and Immigration and Customs Enforcement. 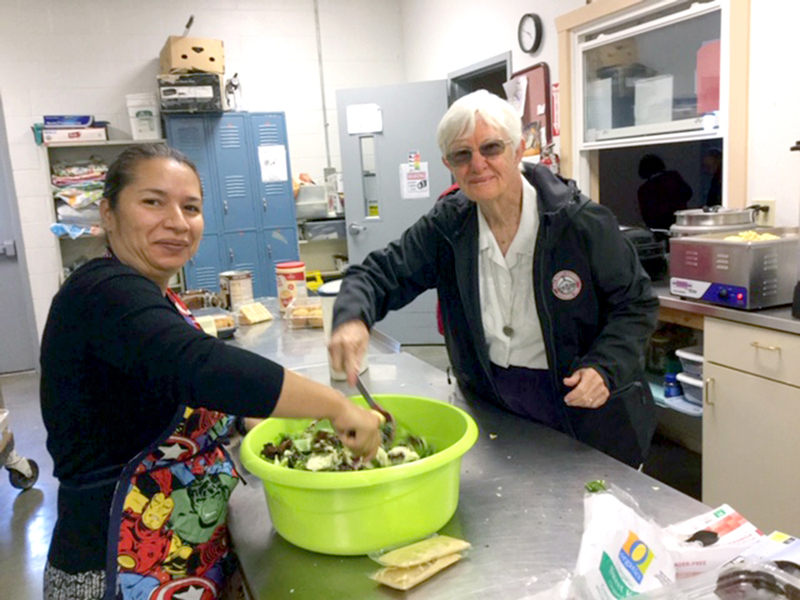 On the feast day, Sisters and Associates from the Yakima Mission Centre helped out at a food bank in Toppenish, WA. 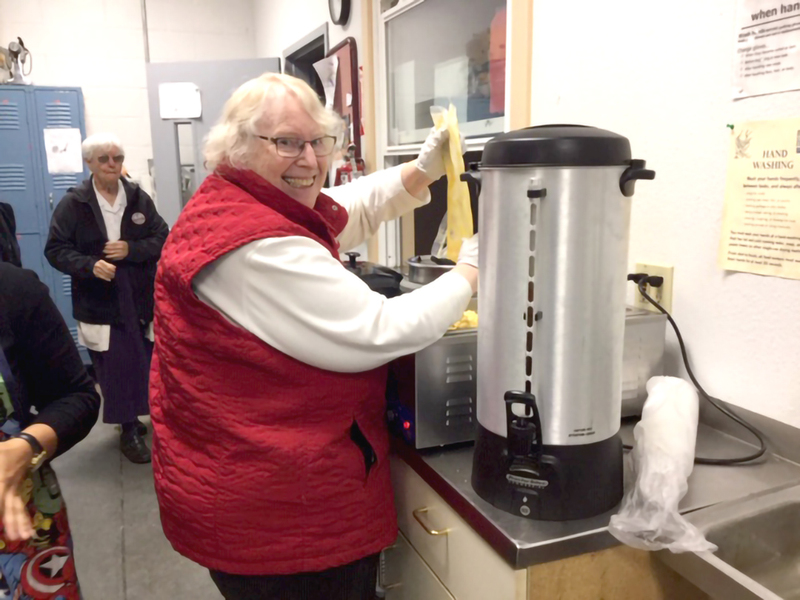 Every Saturday a lunch is served to people experiencing homelessness. 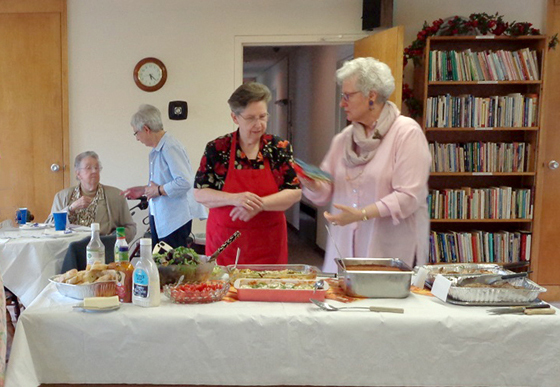 In the Mid-Atlantic region, members of the congregation gathered to pray and write letters to legislators. Six members shared a prayer and read from Pope Francis’ Laudato Si’ encyclical before heading for the Long Branch tributary to the Anacostia River to work on cleaning up the water before it flows into the Chesapeake Bay. 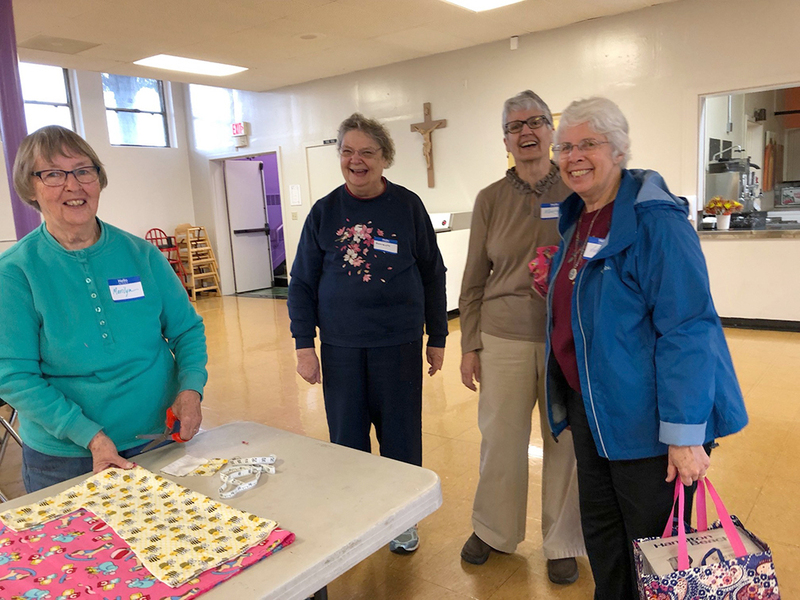 Sisters, Associates and students at Holy Names schools in the Bay Area joined forces for several service projects as well as community-building activities. 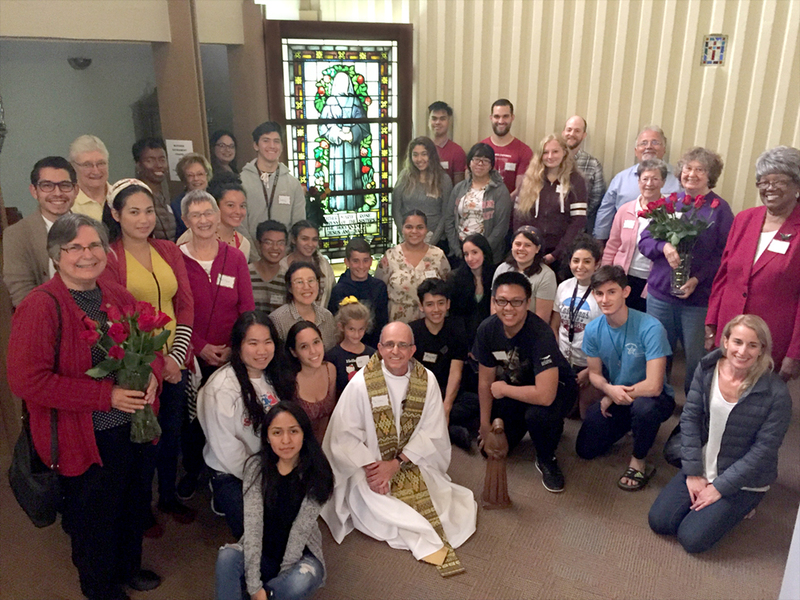 Holy Names University students played Blessed Marie Rose trivia and wrote cards to retired Sisters in the South Bay. 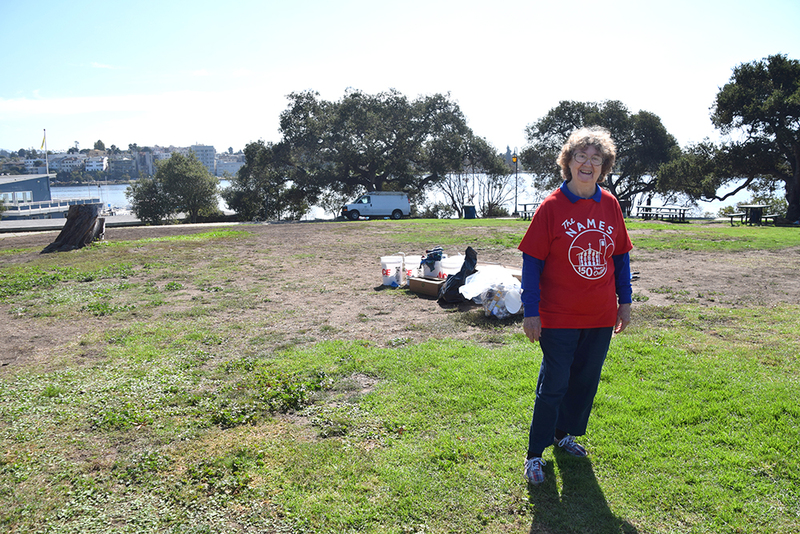 On Oct. 5, students, alumni, staff and volunteers at HNU including Sisters Carol Nicklas and Carol Sellman worked alongside Holy Names High School students to clean up the area around Lake Merritt where the first Holy Names Sisters lived when they arrived in California 150 years ago. 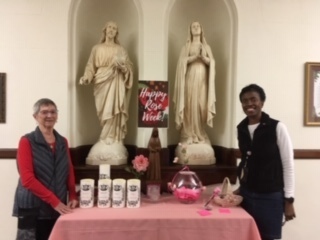 Holy Names High School celebrated Rose Week, with a special Mass on Oct. 3 that included an invitation for students to write their prayer intentions and place them in bowl to be taken to the altar. 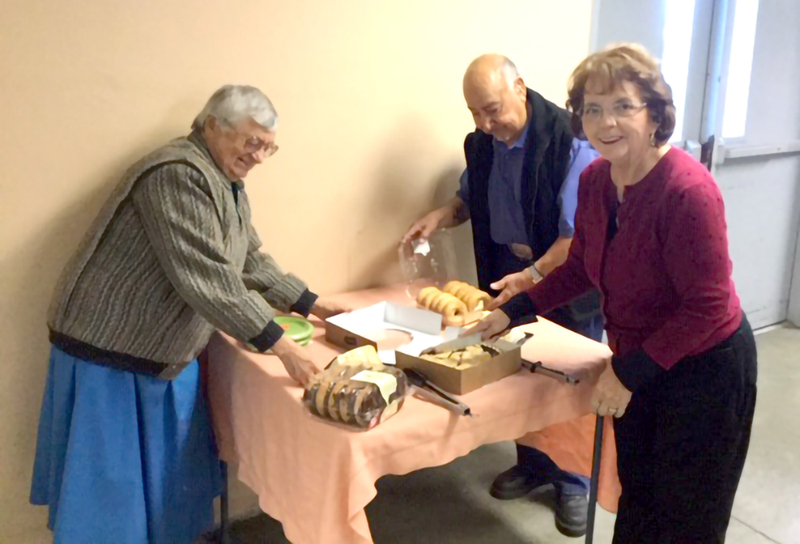 A celebration was held after Mass with a birthday cake for Blessed Marie Rose. 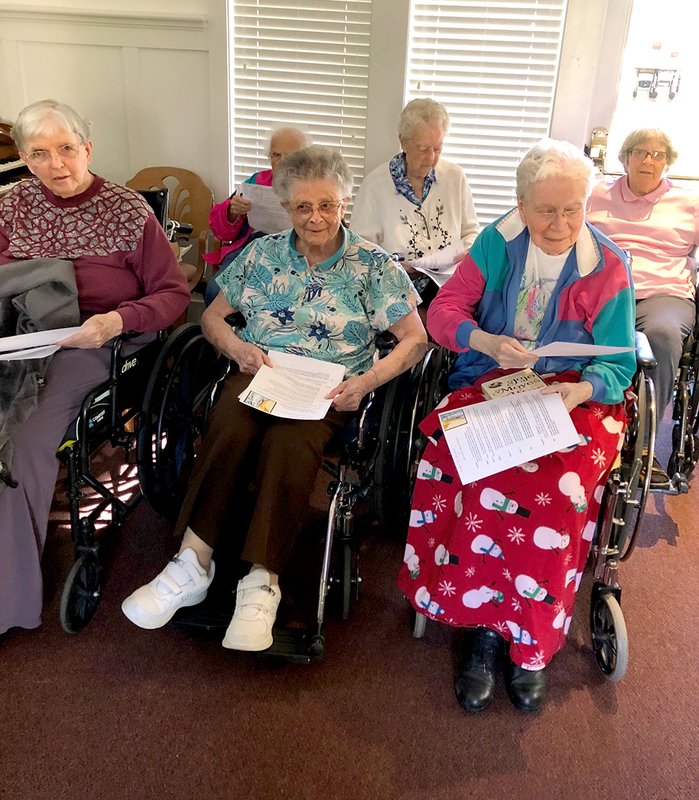 Sisters in an assisted living center in Campbell, CA celebrated Blessed Marie Rose’s feast day with a prayer service created by Sister Aileen Carissimi. 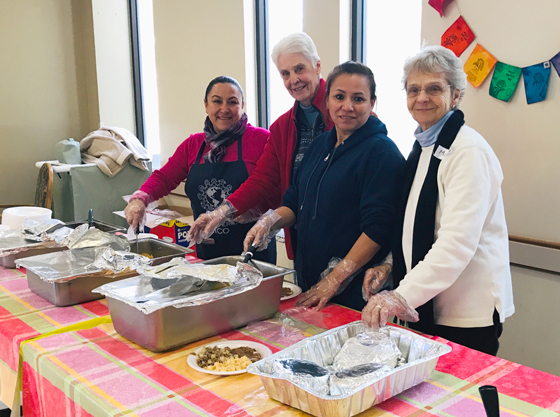 And on the other side of the country, in Albany, NY, a group of Holy Names Sisters, Associates and friends gathered in the former provincial administration building on Oct. 6 to celebrate with prayer and lunch. 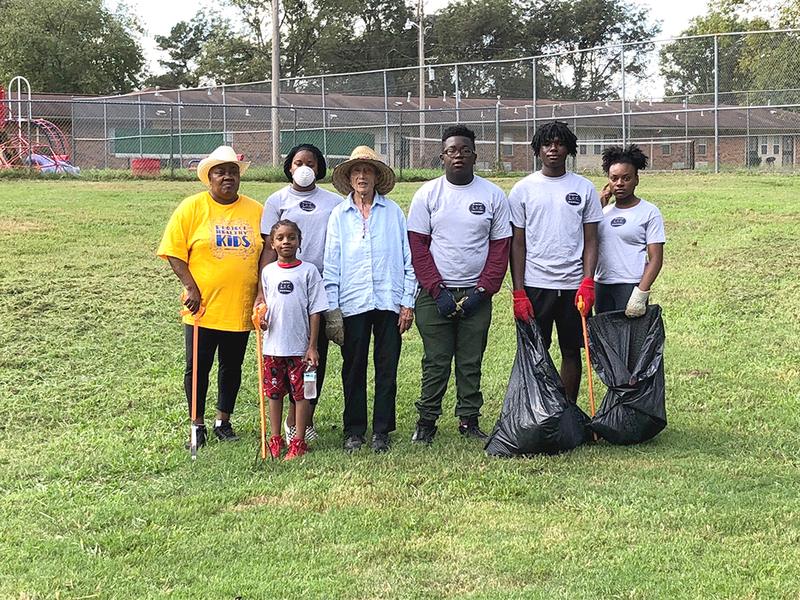 Sister Kay Burton decided to honor Blessed Marie Rose by joining a community group in cleaning trash and mowing the grounds of the Jonestown City Park in Jonestown, MS. 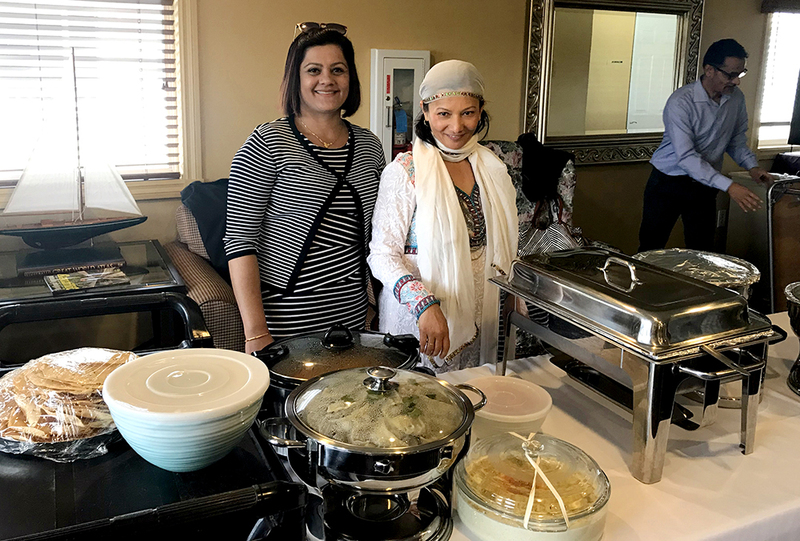 The Holy Names Sisters have deep ties with the people in the area, where Holy Names health and education ministries date back to the 1980s. 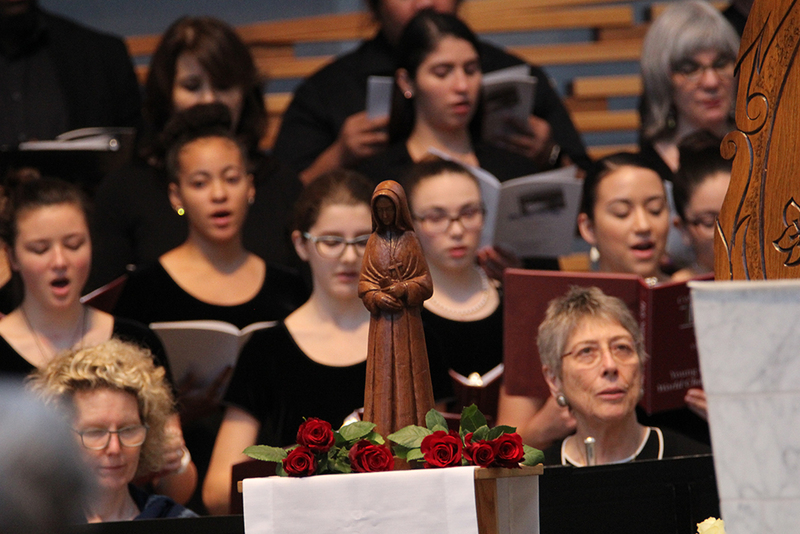 Albany, NY celebrates Mother Marie Rose. L-R: Theresa Cecilia Lowe, SNJM, Marilyn Marx, SNJM, Bea Hall, SNJM and Shannon Lenet, Associate. 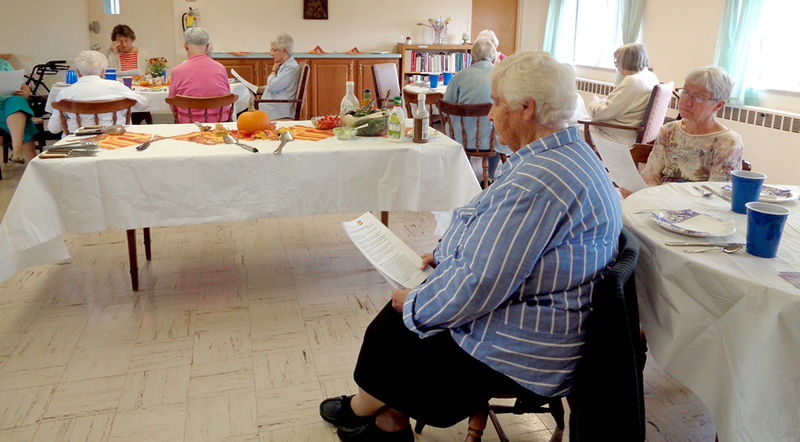 Albany Sisters celebrate feast day of Blessed Marie Rose. L-R: Mary Smith Galmore, City Clerk, Carlos Miles, Destiny Miles, Kay Burton, SNJM, Jamarjay Ewings, Andrew Magsby and Carrie Brooks. 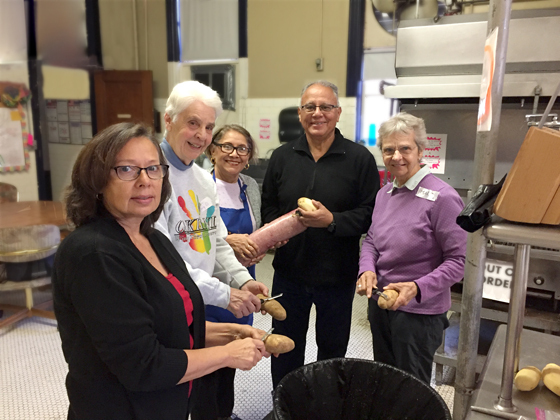 Mid-Atlantic Sisters celebrate SNJM Day of Service and Justice. L-R: Carol Ries, SNJM, Sheila Wooters, Associate, Frankie Barber, SNJM, Carroll Ann Kemp, SNJM, Ann Marean, SNJM and Patricia Rogers, Associate. 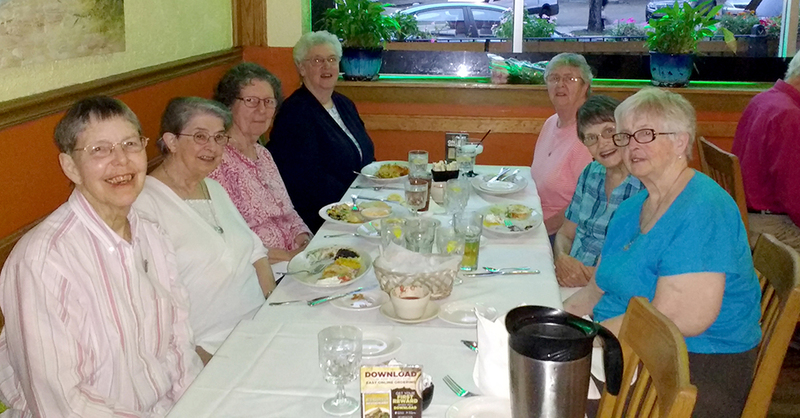 Mid-Atlantic Sisters celebrate Mother Marie Rose. Clockwise, L-R: Kathleen Keller, SNJM, Frankie Barber, SNJM, Maria Faina, SNJM, Mary Ann Dunn, SNJM, Eileen Dunn, SNJM, Patricia Rogers, Associ- ate and Roberta Thompson, SNJM. 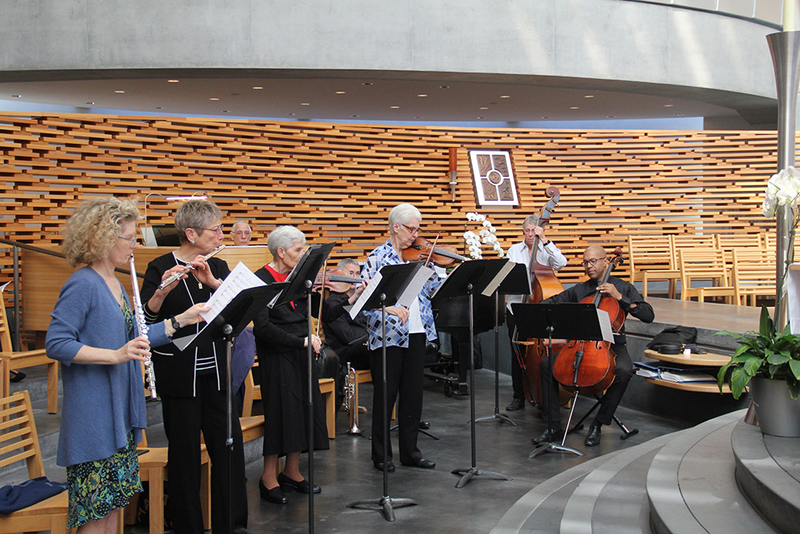 Christian Cahill, candidate, carries the cross in the Cathedral of Christ the Light. 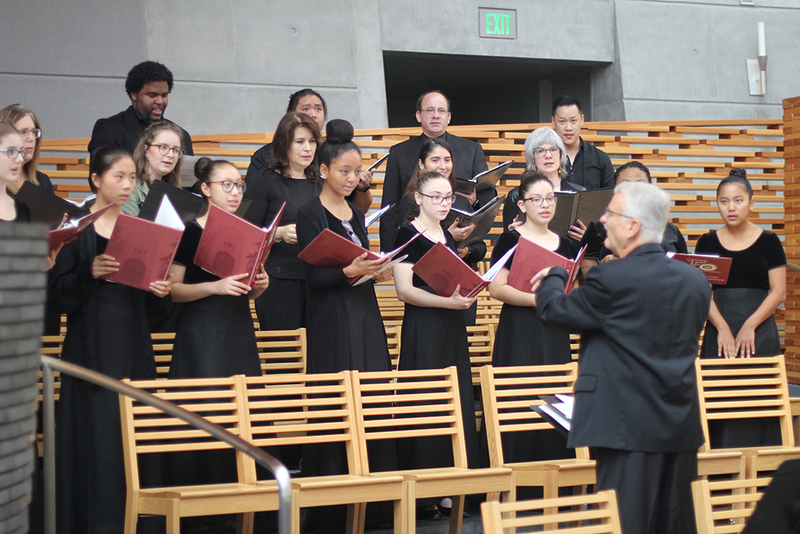 Holy Names High School Choir performs at the Cathedral of Christ the Light. 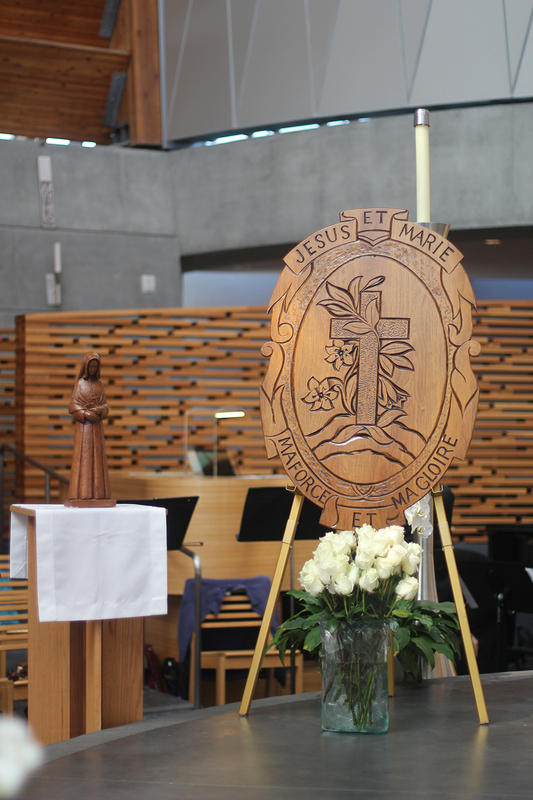 SNJM seal plaque and Mother Marie Rose statue in the Cathedral of Christ the Light. 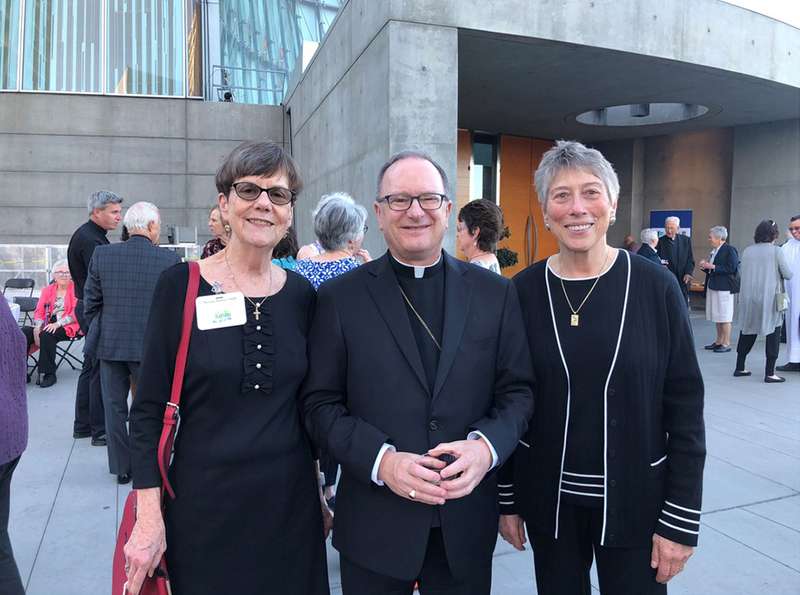 More than 400 people celebrated the 150th anniversary of SNJM ministries in California at a special Mass in Oakland on Oct. 6. 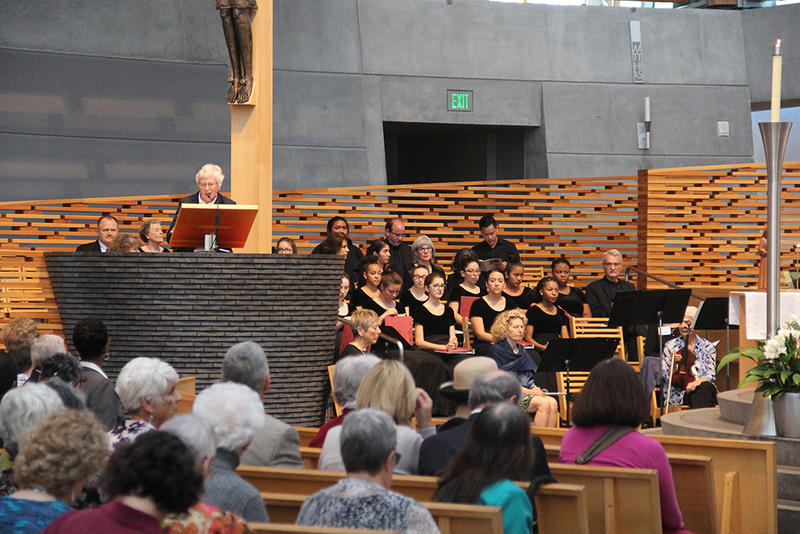 Martha Rolley, SNJM and Kathryn Ondreyco, SNJM accompany Holy Names High School Choir at the Cathedral of Christ the Light. Martha Rolley, SNJM, Kathryn Ondreyco, SNJM and Nicki Thomas, SNJM accompany Holy Names High School Choir at the Cathedral of Christ the Light. 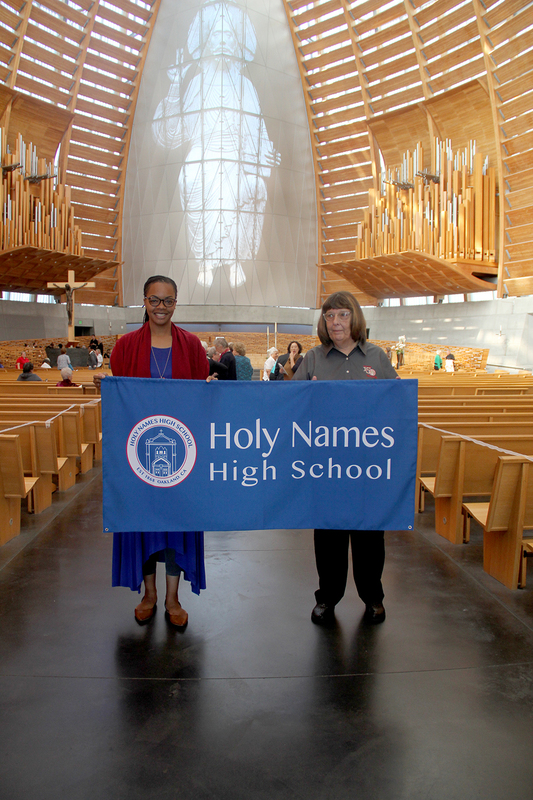 Holy Names High School banner carried during the processional at the Cathedral of Christ the Light. 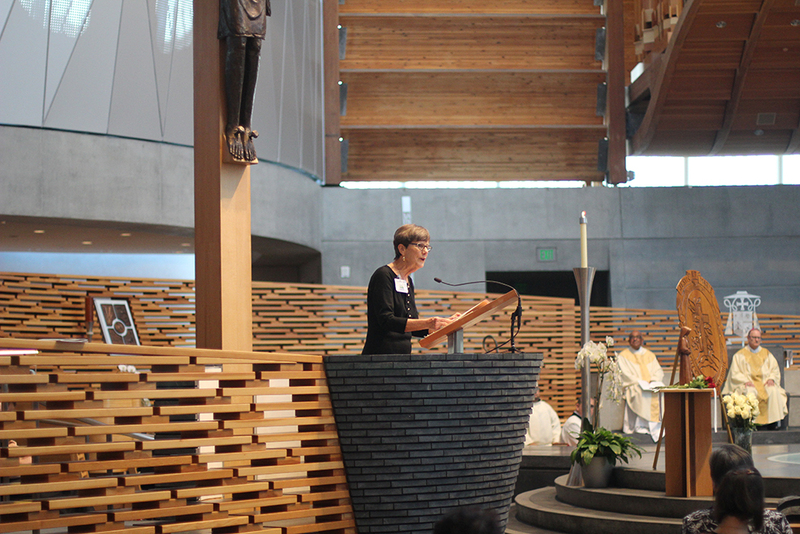 Maureen Delaney, SNJM addresses the congregation at the Cathedral of Christ the Light. 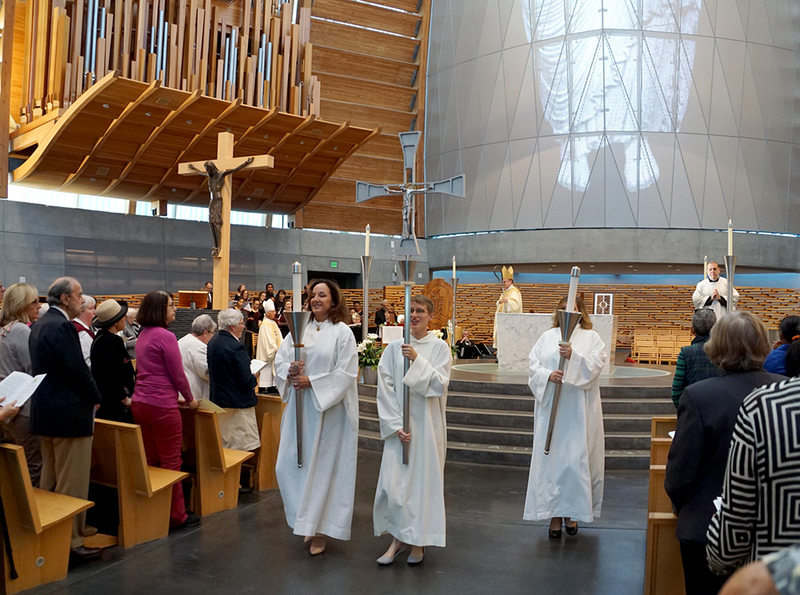 Sisters walk in the processional at Cathedral of Christ the Light. 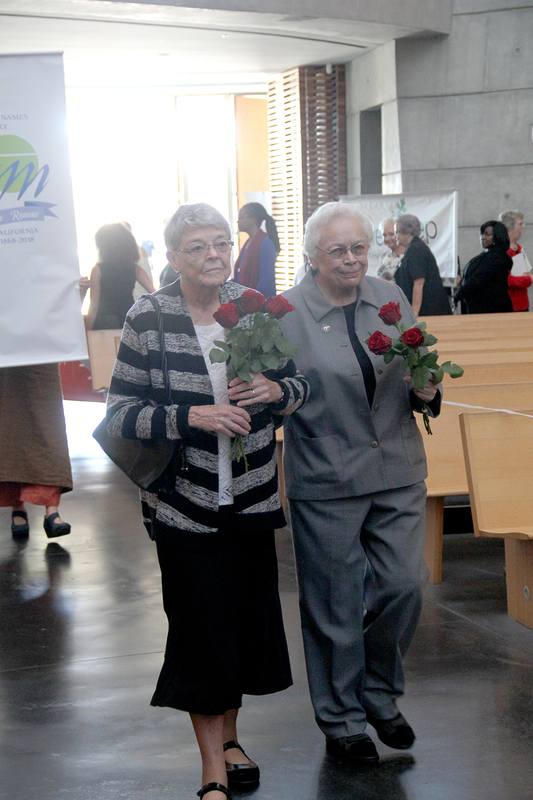 Sisters carry the SNJM seal in the processional at the Cathedral of Christ the Light. Miriam Malone, SNJM addresses the congregation. Statuette of Mother Marie Rose at the Mass. 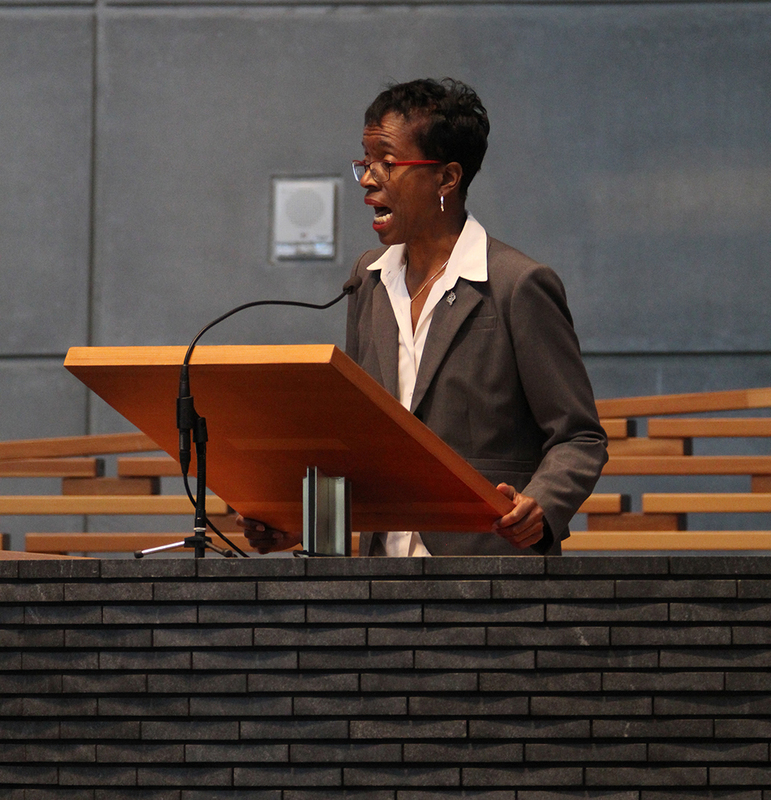 Associate Carrie McClish addresses the congregation. Rosemary Delaney, SNJM addresses the congregation. Miriam Malone, SNJM and Martha Rolley, SNJM after the Mass in Oakland. 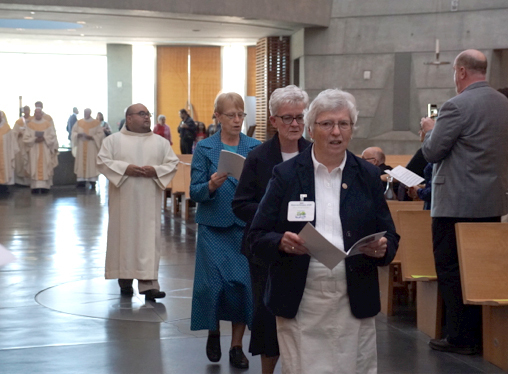 Maureen Delaney, SNJM, Margaret Kennedy, SNJM and Elizabeth Liebert, SNJM walk in the processional at Cathedral of Christ the Light. 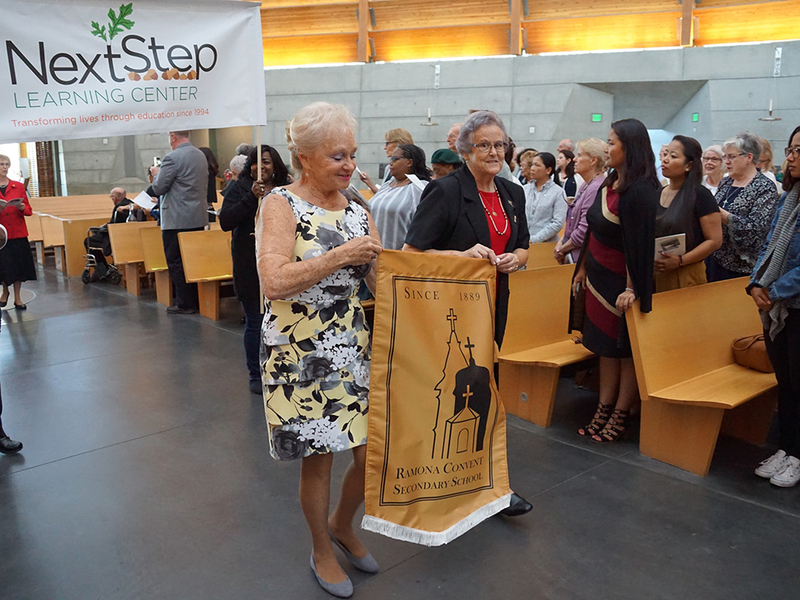 Cheryl Milner, SNJM and Patti Doyle, SNJM walk in the processional at Cathedral of Christ the Light. 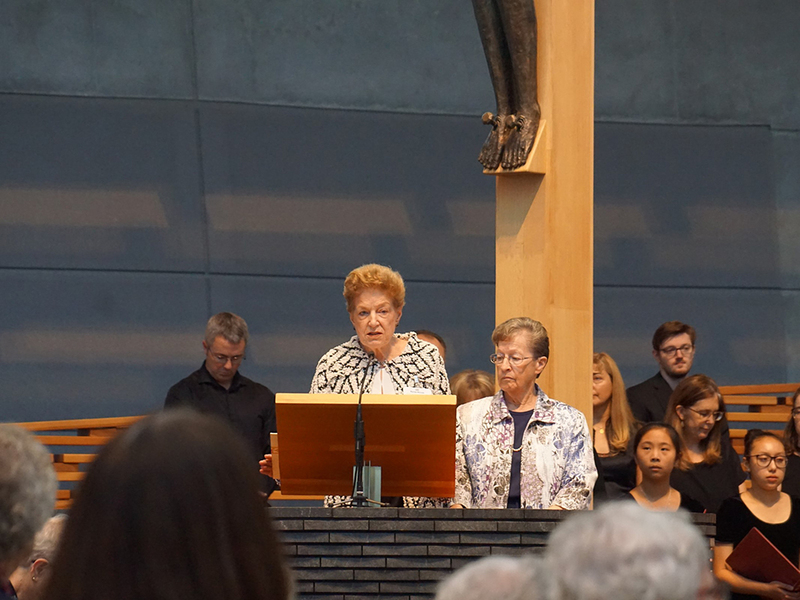 Sisters and Associates address the congregation at Cathedral of Christ the Light. 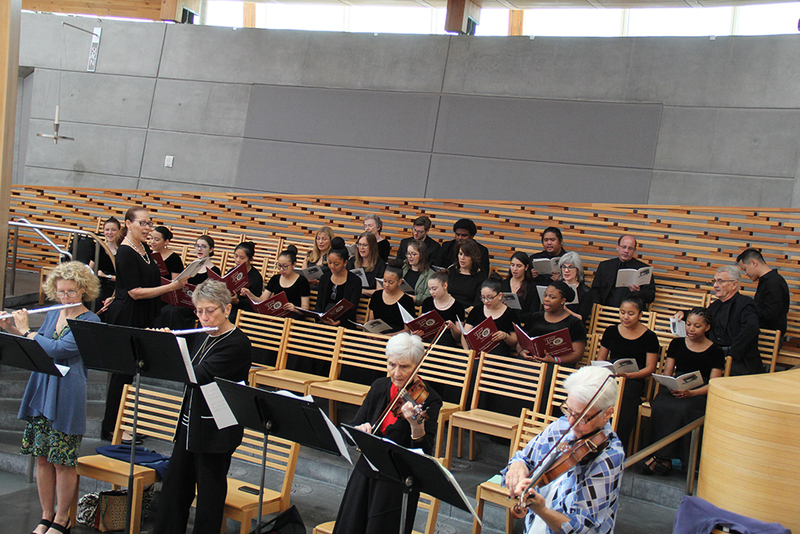 L-R: Marcia Frideger, SNJM (holding flowers), Linda Orrick, SNJM (back left, yellow shirt), Carrie Mc- Clish, Associate (next to Sr. Linda), Marilyn Lewellyn Mackinnon, Associate (pink sweater, second row), Rosemary Brennon, Associate (behind Marilyn), Sophia Park, SNJM (seated, next to Marilyn), Carol Sellman, SNJM (pink sweater, right side), Carol Nick- las, SNJM (holding flowers) and Mary Scott, Associ- ate (far right, standing). Associates Marilyn Mackinnon and Carrie McClish. Birthday cake for Blessed Marie Rose. Bottom: Carol Nicklas, SNJM and Carol Sellman, SNJM (far left in red shirts) with the HNU and HNHS volunteers. L-R: Sharon Collver, SNJM and Kathleen Hilton, SNJM. Phyllis Jaszkowiak, SNJM and Mary Anne Jungblut, SNJM cut fabric for SNJM Day of Service and Justice. L-R: Marilyn Nunemaker, SNJM, Anne Marie Rotter, SNJM, Mary Murphy and Vivian Ripp, SNJM. Back row, L-R: Mary Leo Grijalva, SNJM (partially blocked from view), Marie Kronheimer, SNJM and Lynn Gutteridge, SNJM. Front row, L-R: Miriam Henry Hussey, SNJM, Cathe- rine Nessi, SNJM and Joan Frances Ortega, SNJM. L-R: Michaeline Falvey, SNJM, Joan Bourdon, SNJM, Gail Milholland, SNJM, Jean Elizabeth Griffin, SNJM, Gerrie Will, SNJM, Collette Carroll, SNJM and Aileen Carissimi, SNJM. L-R: Linda Riggers, SNJM, Anne Herkenrath, SNJM, Mary Annette Dworshak, SNJM, Lydia Nikolaisen, SNJM, Judy Ryan, SNJM, Georgia Yianakulis, SNJM, Teresa Shields, SNJM, Shelagh Lustig, Associate and Sue Wildermuth, Associate. L-R: Lydia Nikolaisen, SNJM, Anne Herkenrath, SNJM (both seated) and Mary Annette Dworshak, SNJM (next to them in red coat). Behind banner, L-R: Monica Moffatt, SNJM (turquoise coat), Christopher Shelley, Associate, Sue Wildermuth, Associate, Geor- gia Yianakulis, SNJM, Iva Gregory, OP, Linda Rig- gers, SNJM, Teresa Shields, SNJM, Jocie-Rhea Chism, SNJM (partially obscured with umbrella), Shelagh Lustig, Associate. Front row: Judy Ryan, SNJM (with cup in front of banner). Bhutanese cooks prepare meal for the feast day of Mother Marie Rose. 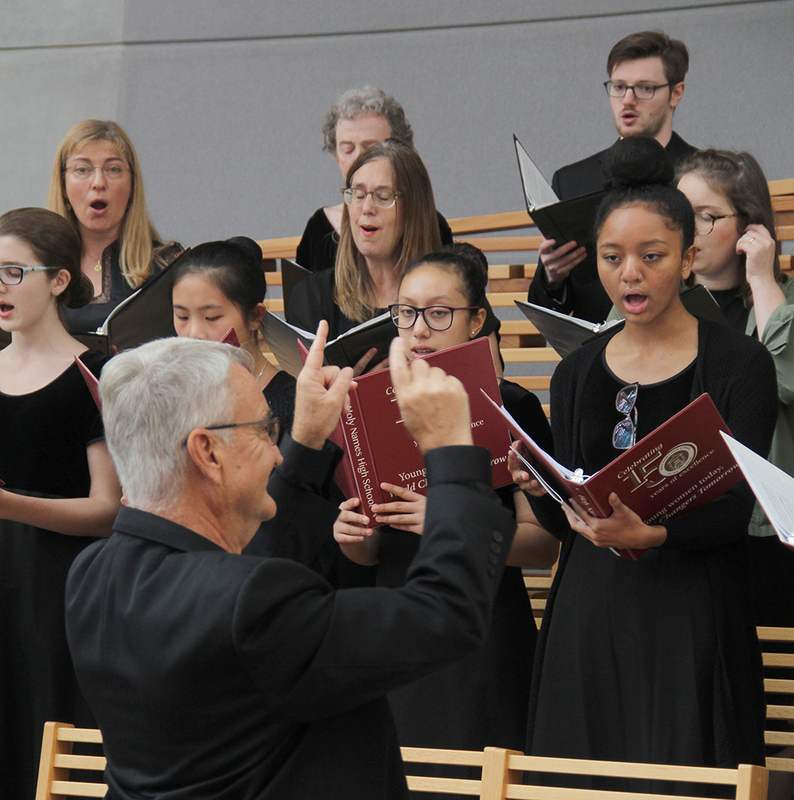 Brother Jackson Lino leads children’s choir. L-R: Cecilia Chavez, Associate and Charlyne Brown, SNJM. L-R: Marina Rose Parisi, SNJM, Nino Vijarro, SNJM and Janie Vijarro, SNJM. 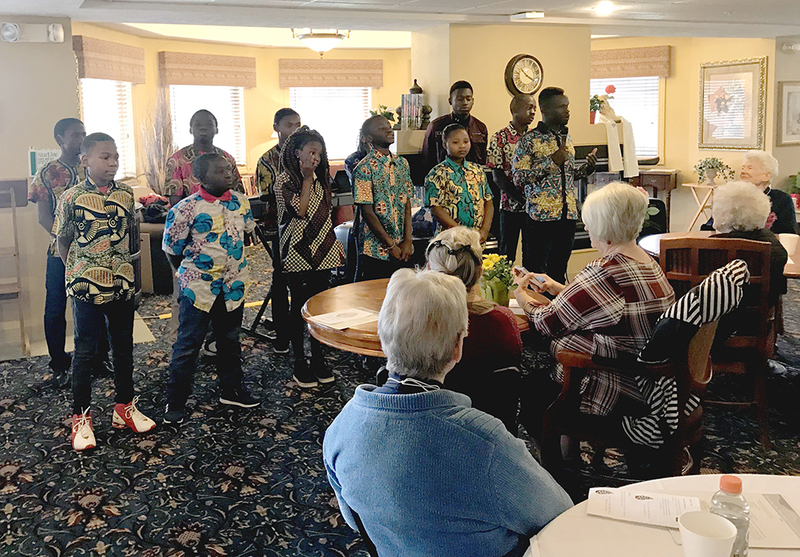 Forty students from three nations came together in July for the SNJM Youth Justice Forum, an intensive week of study and service inspired by the legacy and spirit of the Sisters of the Holy Names. 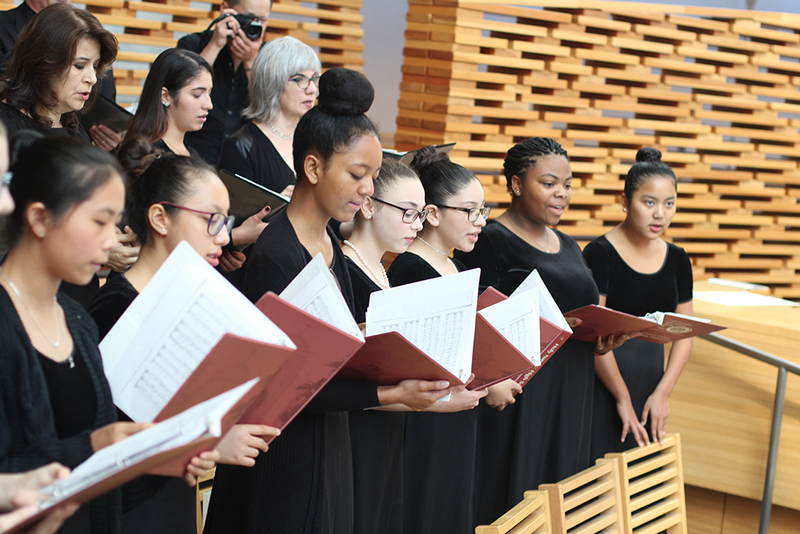 All 40 girls, who attend SNJM-affiliated schools throughout the U.S., Canada and Lesotho, were included in the surprise announcement of Holy Names University‘s Marie Rose Durocher Youth Justice Leadership Scholarship awarding them four years of full undergraduate tuition at the university, which hosted the gathering. It was the fourth SNJM Youth Justice Forum, which connected the students with Sisters and lay people who led them in an exploration of the Sisters’ corporate stands on the right to clean water, against human trafficking and for the human rights of migrants and refugees. 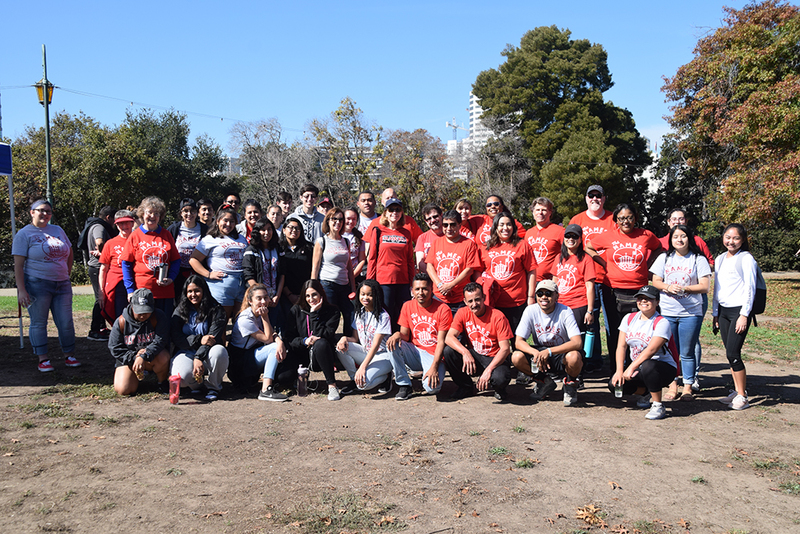 The girls participated in service projects throughout the city of Oakland, helped to clean Lake Merritt as part of their study on water (pictured above) and visited the Oakland Museum. 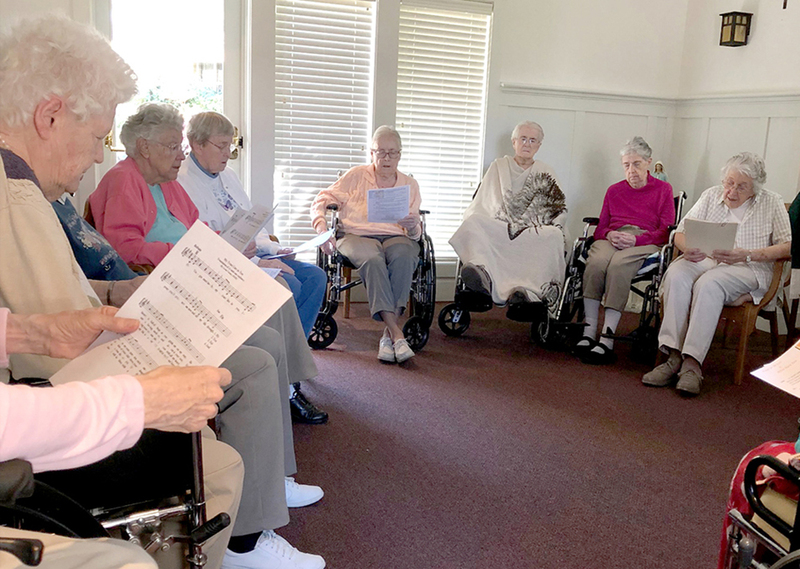 They listened to a panel of Holy Names Sisters and Associates, including Sisters Joan Doyle, Fran Kearney, Mary Haupt, Anna Keim and Mary Rogers and Associates Marilyn Mackinnon and Mary Scott. Each of the panelists shared their experiences of the SNJM charism and thoughts on the future of religious life. 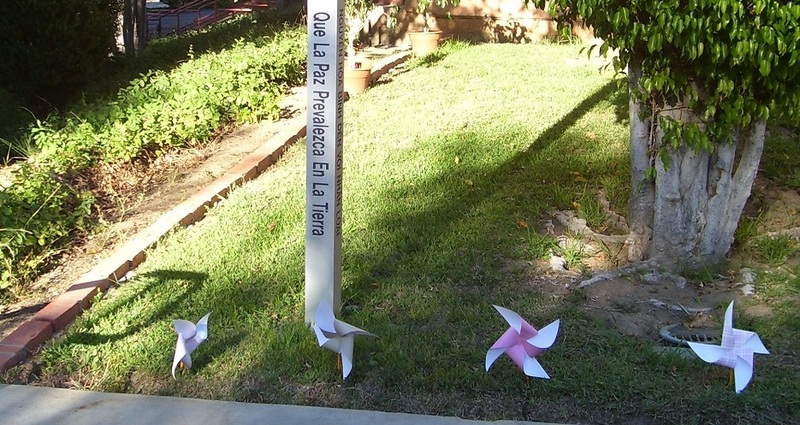 The students left the forum grateful and renewed in their work towards justice. All of the groups will return to their schools to carry out a service project that they discussed and planned during the forum. 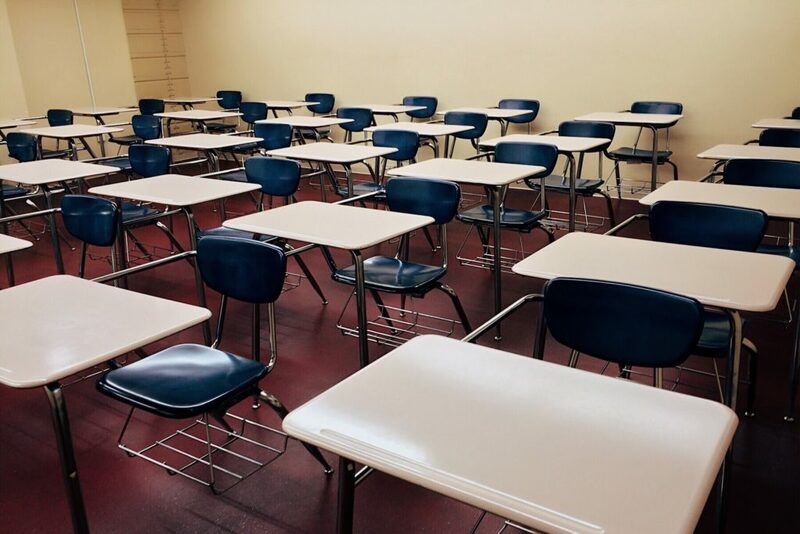 In a Facebook video filled with messages of appreciation, many of the students spoke about how deeply they were affected by their experiences with the Sisters. 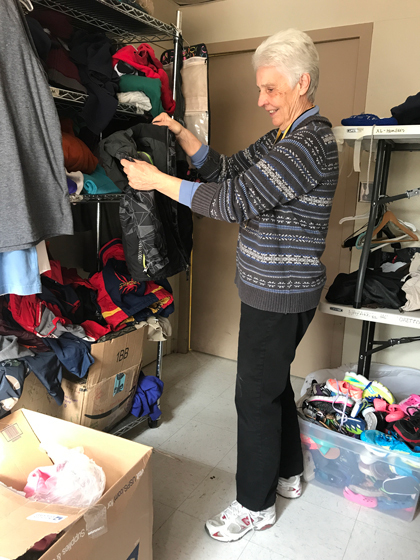 “It means so much to us, and I think that by recognizing the love and devotion you have to all of the corporate stands, we ourselves will be able to bring that love back into our communities,” said a student from St. Mary’s Academy in Portland, OR. Click here to visit the SNJM Youth Justice Forum Facebook page. Silent Witness in Support of Our Immigrant Sisters and Brothers from SNJM U.S.-Ontario Province on Vimeo. 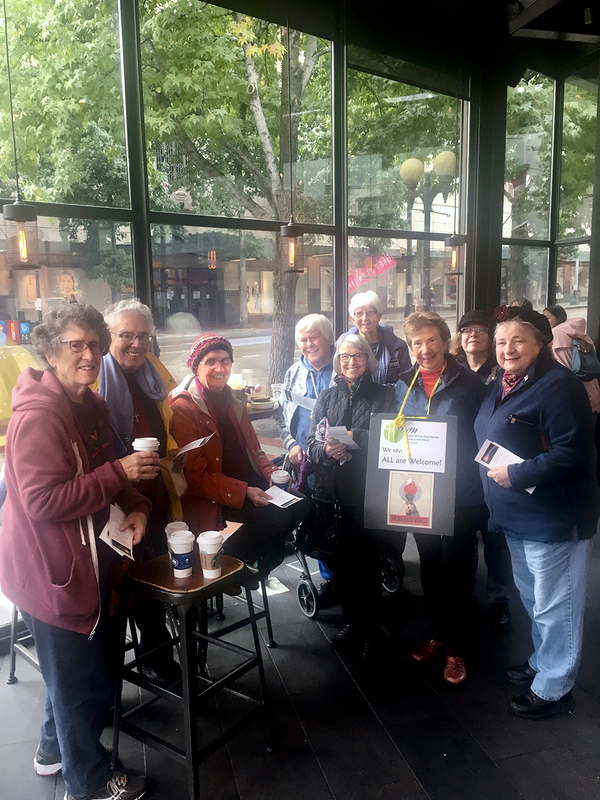 Sisters of the Holy Names of Jesus and Mary, Associates and staff took to the streets on July 7, 2018 to show support for immigrants to the U.S., especially the families of desperate asylum-seekers.During their five-day Chapter meeting in Portland, OR, the Holy Names Sisters and their allies prayed and called on U.S. leaders to respect the human rights of all people, and also repeated their call for the U.S. government to immediately reunite children separated from their parents by ICE on the southern border. The Sisters have repeatedly called on their members of Congress to abide by the teachings of Jesus and to heed the word of God in the Bible: “The stranger among you shall be to you as the native among and you shall love them as yourself for you were once aliens in the land of Egypt.” (Lv 19:34) Our faith requires us to welcome the stranger and to offer compassionate care to those who are forced to flee their home countries because of persecution or violence. We call on Congress to do the same. 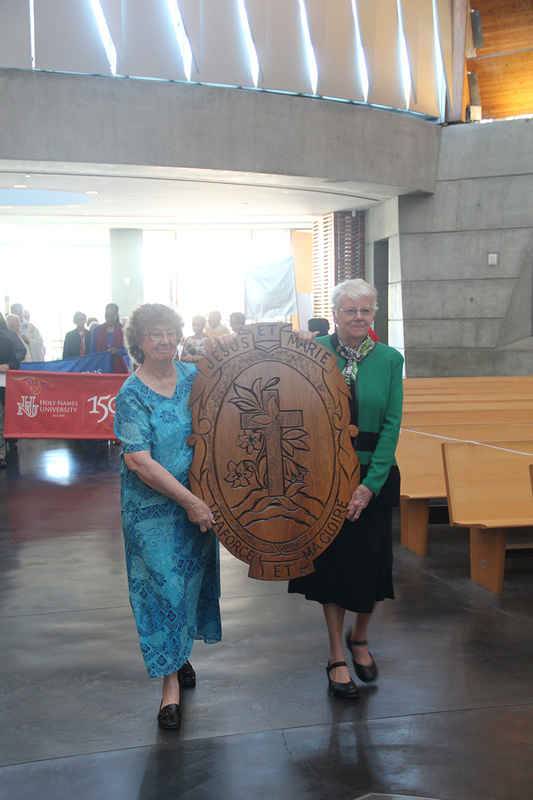 For more than 50 years, Sister Catherine Ferguson has been serving as a Holy Names Sister throughout the world. 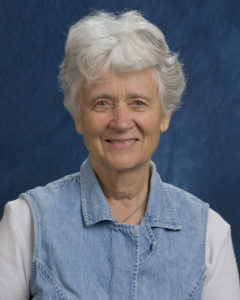 During her career, Sister Catherine, who has served in SNJM leadership, also taught high school in both Oregon and Washington, researched Christian base communities in Latin America, received her doctoral degree in International Studies and founded and coordinated UNANIMA International, an NGO doing advocacy at the United Nations. This spring, Sister Catherine will take on a new role as a board member of NETWORK, a Catholic social justice lobby. 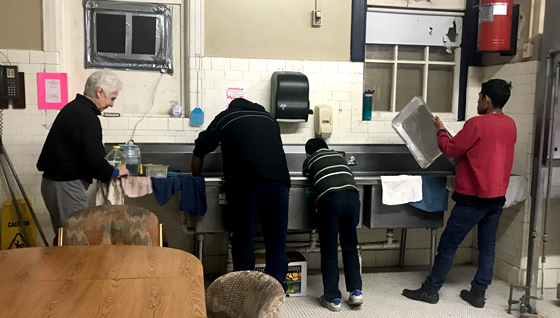 NETWORK’s mission is to transform social and economic inequalities in the U.S. by working for just wages, quality healthcare, protecting the rights of immigrants and assuring affordable housing for all. 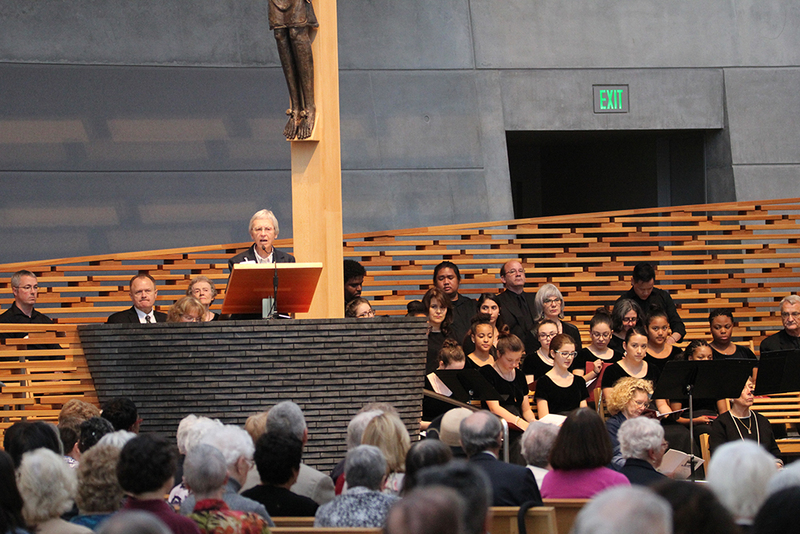 NETWORK’s mission is grounded in Scripture, Catholic social teaching and lived realities. It seeks justice by advocating for federal policies consistent with Gospel values. 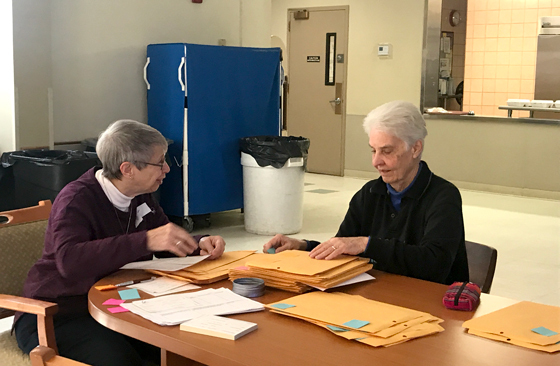 Sister Catherine and other NETWORK board members will serve on both the NETWORK advocacy board and NETWORK lobby board starting in April. In this capacity the board members ensure that NETWORK fulfills its mission and maintains a sustainable organization. 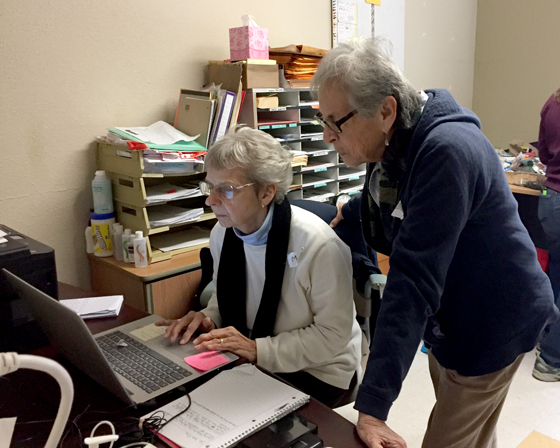 With her many years of experience working as an advocate on the international level, Sister Catherine is ready for the new opportunity to advocate domestically. “Right now I think NETWORK will be advocating especially for immigrants,” she said. She also identified other important issues such as affordable healthcare, creation of jobs and the development of a federal budget which responds to the needs of the country and fulfills our obligations to the international community. More information about NETWORK can be found at https://networklobby.org.